Well, having my windows repaired by a glass shop was a mistake. They had no idea what they were doing despite their claims to the contrary. 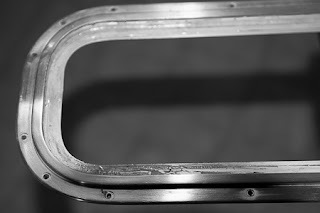 As a result, I no longer have a gasket to hold the panes in place, and they pop out with slight finger pressure. Not going to work. This set me into a week long research project with the goal of learning the techniques which I had assumed the shop knew. The first thing I learned is that you always want to use cast acrylic on a boat. That was mistake #1 made by the glass shop. The second thing I learned is that the ideal adhesive for the job is Dow Corning #795. DC795 is a structural silicone adhesive which comes in black, grey, and white. Yes, there's other stuff, but 795 is what you want to use. Having made it this far, I ordered the goop and began trying to clean the silicone out of the aluminum frames. Oh, what a nightmare it is to remove silicone from anything. It leaves a nasty thin layer which seemed only to lift from mechanical effort (read: scraping). I spend a few days trying to find a magic cleaner, but eventually ran out of sites to research. Thinking about the effort involved in cleaning out all four frames, I decided to try a second round of outsourcing. My research had brought me to the web site of Select Plastics a few times, with many people referencing that they really know their stuff and have a quality marine oriented business. I sent them pictures of my frames and dimensions, and requested a quote for panes replacement. What I got back was not what I'd expected. It was a simple email asking that I call them back. I spoke to the famous Tony D'Andrea (well, he's famous if you spend time researching marine hatch / port fabrication!) who advised me to throw away the aluminum frames and the new Makrolon panes. Yes, he said I should throw them away. Apparently, this style of window fabrication rapidly fell out of favor, and hasn't been used since the early 1980s. Even if they could perform the repair, Tony indicated that it would not meet ABYC standards. Fortunately, he had an alternative for me. His recommendation was to use 3/8" cast acrylic cut oversize. The acrylic is then mechanically fastened to the cabin sides with a minimal number of bolts whose sole purpose is holding it in place while the adhesive cures. He recommended Dow Corning #795. When the adhesive was sufficiently cured, fasteners should be removed and the holes filled with 795. This ensures that seasonal flexing, contraction, and expansion would not create a stress point at the bolt and compromise the plastic. Well, ok. This would indeed be cheaper than buying pre-fabricated ports and doing a lot of fiberglass work. I did a bit more research on this process, consulting Don Casey's This Old Boat. Mr. Casey also recommends this approach, although he does not go so far as to have the screws removed. I plan to follow Tony's advice as I like the idea of not seeing the bolts. What Casey does add to the project is some guidelines for sheet sizing. The sheet should overlap the cabin by three times its thickness on each side. In the ca of a 3/8" sheet, the overlap would be 1-1/8" all the way around. The fastener location line is drawn 1.5x the thickness + 1/2 the diameter of the mounting holes inside the perimeter edge. Fastener locations for 3/8" are recommended at 4-1/2", but Tony's suggestion was to use much less as they are only to hold the acrylic in place while the sealant cures. In the case of my 48" windows, I'm probably going to use a total of 6 evenly spaced fasteners, and only because I need to hold a bit of a bend in the sheet. If the cabin walls were more flat I would probably use even fewer. So, my next step is to measure the frames and see if they will serve as templates. If not, I need to figure out how undersized they are and make up the right ones. Next, I need to consult with the plastics dealer on how much flex is acceptable, and if this exceeds it, see what my options would be for subtle forming of the sheet.